The UK`s leading National dedicated brand for Park & Leisure Home announces not 1 but 2 Shows for 2019. April 11th to 14th `South of England` Show (at the South of England Showground, Ardingly - close to London Gatwick) specifically aimed at those from London, The Home Counties and the South of England in General then returning to NAEC Stoneleigh, in Warwickshire for 6th to 9th June 2019. 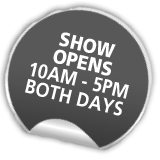 Both shows dedicated to bringing together a massive display of homes (including the latest models) from leading Manufacturers. There`s also information on hundreds of Parks across the UK and industry experts on hand to offer advice and guidance. All that, Plus an extensive range of companies providing services, related products and innovative ideas including heating solutions, Insurance, Insulation, Refurbishment, Electrics, Decking, Environmental Services, Estate Agencies and so much more. Don`t miss these 2 amazing shows. Discover fantastic locations to live the dream, find new neighbours, view the latest homes in their natural environment and find everything you need to take advantage of this wonderful leisure lifestyle. Whether Residential or Leisure - you won`t be disappointed. With FREE Entry and FREE Parking. Plus, each visitor will receive a complimentary Show Guide. Dogs allowed if kept on lead and under control.